Many thanks to Sheriff McCabe for having the inmate work crews clean-up Wards Corner last week. They cleaned up Granby St from Little Creek Rd to Forest Lawn, the HRT transfer station lot, and the City side of the exit ramps. 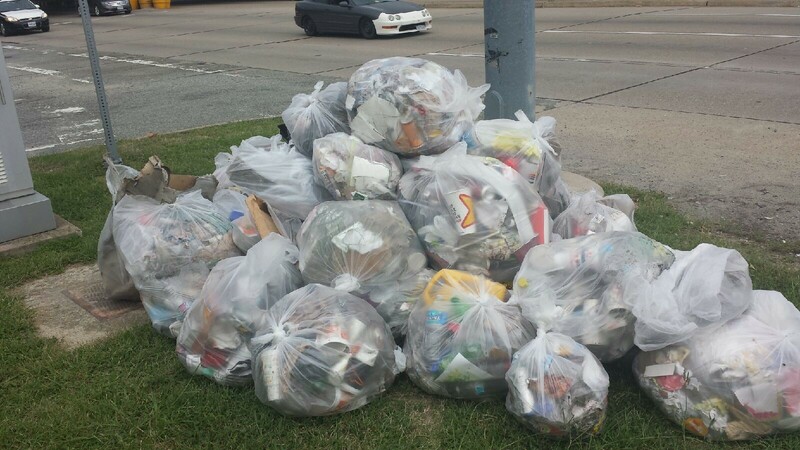 A total of 64 bags of trash was collected. Thanks to Sheriff McCabe and Chief of Community Correction, Mike O’Toole or coordinating. Thanks to the Wards Corner Business Association for beginning the effort as well! Thanks to Ray Ransom and Freda Burns, both with the City of Norfolk, for their quick response to my inquiry about the lane closure on Granby Street in front of the new TowneBank. The cause for the closure is a sewer line collapse under the sidewalk. According to Norfolk Utilities, the sewer line has been replaced and final restoration should be completed within the next two weeks. You are currently browsing the Wards Corner Now - Wards Corner, Norfolk, Virginia blog archives for September, 2014.